Hundreds of people have taken part in protests along the Irish border in protest against Brexit. They were held as Prime Minister Theresa May looks at ways to bring her EU withdrawal agreement back to the House of Commons for a fourth time. Protesters gathered at border locations in counties Armagh, Down, Fermanagh, Tyrone and Londonderry. The demonstrations were organised by the Border Communities Against Brexit group. Appearing at a protest near the border at Killeen in County Armagh, Sinn Féin MP Chris Hazzard said that the "only way forward" is the withdrawal agreement and the Irish border backstop. "As we stand here today, we are none the wiser," said Mr Hazzard. "We can only know the one thing, that as each day goes by we get closer to the cliff, we get closer to that no-deal situation. "And that's why you will have seen so many people out here today." Kay Donegan, a nurse at Daisy Hill Hospital in Newry, was among the protesters at the border at Killeen. She said she was worried that people on both sides of the Irish border would lose out on access to emergency healthcare as a result of Brexit. Patients in north County Louth - a bordering county in the Republic of Ireland - travel to Daisy Hill Hospital for treatment. "Our emergency services traverse the border freely at the minute, with ambulances and fire crews going from either side where help is needed. "[With] any emergency treatment, time is of the essence so anything that impacts on that ability to get to the nearest place to be treated has to have implications on how well you will do." 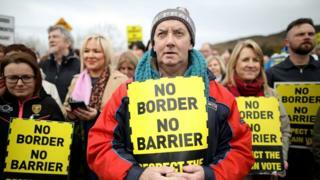 Speaking at the protest in County Londonderry, Dermot O'Hara, the chair of the Derry branch of Border Communities Against Brexit, said the rallies "all have the one message". "If we're going to abide by democracy then let's have democracy and let's respect the will and the vote of the people in the north of Ireland," said Mr O'Hara, referring to the majority of voters in Northern Ireland who supported a remain vote in the 2016 referendum.